The context: why should I need to know this stuff? In the last years front-end web development has became one of the most exciting areas of IT and software development, as front-end developers we have a tone of new tools, APIs, editors, packages, etc. that make our life easier. There is an area that is particularly interesting: Responsive web design, but now, we try to go a little bit further, and not only create amazing responsive web sites, but also we try to provide the best web experience for our visitors, there is one aspect that is in particular really important when we create web portals: loading the resources depending on the device, it doesn’t matter if it is an smartphone, a tablet or a high resolution desktop; we must provide different views per device, and here is when something come out! 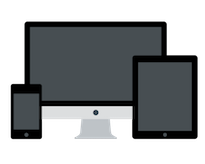 Most of websites are responsive but many times the views or layouts only hide or show graphic elements (like menus, carousels, blocks, etc.) that means all the resources are loaded even if they will not be used on phones or tablets. Instead of just hiding or displaying elements depending on fixed media queries, we can provide a better mechanism which is called Adaptive Web Design. When we talk about adaptive, we mean we must load only the resources that are really necessary for displaying our views depending on the user’s device, for example if I have a list of news but in desktops I show titles, summaries, and images, but in smartphones I am only interested in displaying the titles, why in the phones should I load the summaries and images. IBM WCM 8.x (that stands for IBM Web Content Manager) as a private product has a great solution for providing Adaptive Enterprise Web Portals, what it basically does is to expose a set of plugins that help us decide which resources we are going to load depending on the user’s device. For desktop and tablets where we have more space to distribute our news (titles, thumbnails, summaries, etc. ), so, it makes sense to include more HTML elements. For smartphone since we have less space available we don’t render all the information but instead just the titles. I hope you find this short article useful for your future implementations and remember be happy with your code! If you are a fan of web design, UI patterns, material design, and all those great concepts and practices then this conference is for you 🙂 enjoy! Web Components, Shadow DOM? DOM Framework? Ok, no so fast, have you listened what is coming in the way we create web portals? No yet; then listen this excellent talk and I promise, you will learn a lot of great things! The future is here and now!